Abia Warriors football club of Umuahia Chief Coach, Abdullahi Usman Biffo has expressed satisfaction with the performance of his boys in their 2-0 win over visiting Shooting Stars Sports Club of Ibadan in a Nigeria Professional Football League game at the weekend even as he dedicated the victory to the club's injured top scorer, Sunday Adetunji. Speaking to www.abiawarriorsfc.com shortly after the encounter decided at the Umuahia Township Stadium, Biffo said the entire team decided to play and win for Adetunji, the club's top scorer this season who fractured his left arm in Abia Warriors' 4-2 away win over Lobi Stars in Makurdi and is now receiving medical attention at the Federal Medical Center, Umuahia. "He (Adetunji) is a very important member of our team and we miss him so much. All of us were worried when he sustained the injury and so we decided that the best thing to do for him would be to continue winning our games", Biffo further stated. 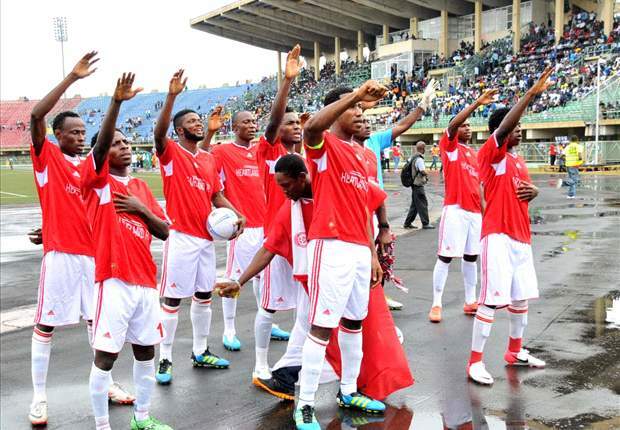 The coach said Abia Warriors will not be distracted by its recent results which has seen the team go five matches unbeaten but would continue to work harder in order to finish at a respectable position at the end of the season. In the match against Shooting Stars, Ndifreke Effiong opened scoring in the 13th minute and forced under pressure defender, Samuelson Ngongo to beat his own goalkeeper, Charles Tambe for the second goal with four minutes to end the first half.